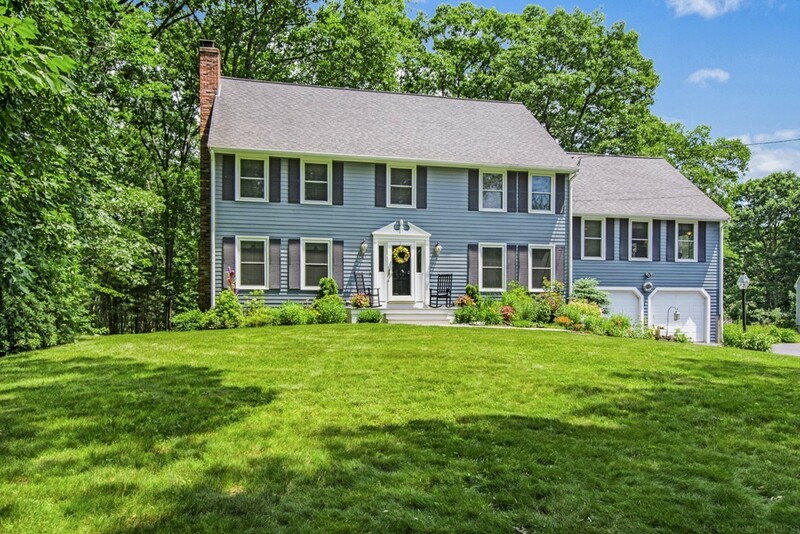 Fabulous Home on a beautiful 4.6 acre lot in a great North Andover location! The 1st floor features gleaming hardwood floors and wonderful oversized windows throughout. The lovely fireplace in the living room, charming wainscoting in the dining room, and bay window in the office are just a few of the features that make this home so sought-after. Large eat-in kitchen with access to the adorable sunroom with 2 charming skylights. The half-bath and laundry room complete the first floor. Head upstairs to your mid-level family room with beamed cathedral ceiling, brick fireplace, and lovely oversized window! The second level features your spacious Master suite with double vanity en-suite bath and large walk-in closet/dressing room, as well as 2 additional bedrooms and a second full bathroom. The finished basement offers a wonderful bonus room, perfect for a play/game room. Looking for outdoor space? This home features a large back deck, front patio, and storage shed. Don't miss out!